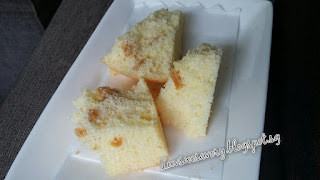 I couldn't agree more with Zoe of Bake for Happy Kids that this yogurt cake is "light and spongy and it tastes a little like smooth and milky cheesecake" I must say that this cheesecake-like yogurt chiffon cake with tangy apricot is SO SO SO good to eat ! 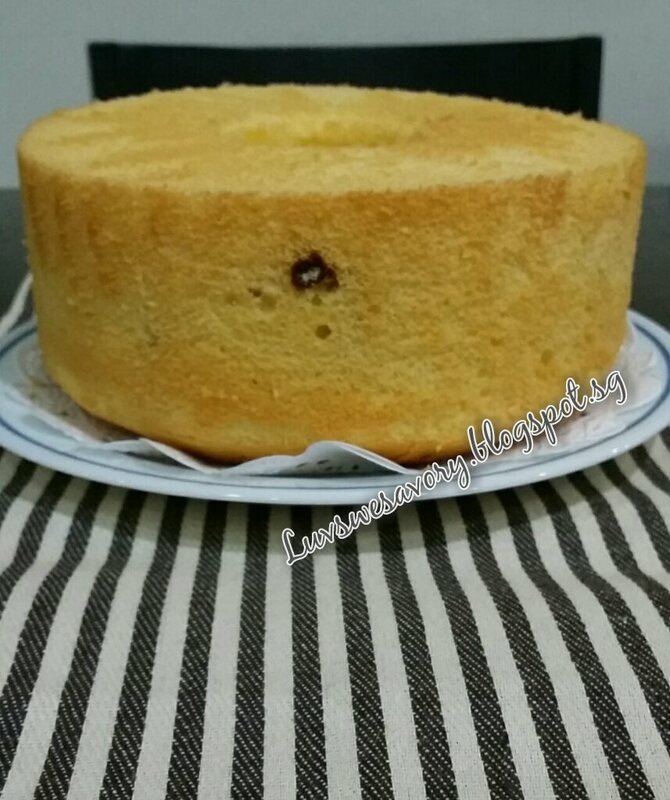 This is not the first time I baked chiffon cakes with added dried fruits like cranberry, raisins etc. But I seldom add dried fruits for my chiffon cake as I find it difficult to make a neat and nice cut due to bits of fruits. Perhaps to chop/mince the dried fruits finely may help. First time I incorporated yogurt in chiffon cake recipe and I simply love the cheesecake-like soft and light yet fine crumbs texture. 1) Coat the dried apricot with 1 tablespoon of cake flour. Sift to remove any excess un-coated flour. Set aside. 2) Position the rack in the lowest level and preheat oven to 170°C. 3) In a clean mixing bowl, whisk the cold egg whites and cream of tartar till foamy using the electric stand mixer. Gradually add in caster sugar in 3 separate additions and beat till stiff peak, formed into a firm meringue. Transfer to a big bowl and chill in the fridge. 4) In the same mixing bowl, cream together egg yolks and caster sugar until pale and thickened using the electric mixer (about 3 - 4 minutes). Add canola oil and lemon juice and continue beating till combined. Next, add the yogurt and whisk until the mixture is combined. 5) Sift in cake flour and salt and whisk again until mixture is well combined. 6) Gently but quickly fold 1/3 of the meringue into the yolk mixture with a spatula. Fold the remaining meringue in 2 batches into the mixture until it looks evenly mixed (no streaks of meringue). 7) Stir in the flour-coated dried apricots into the batter with a spoon. Pour the batter into the un-greased chiffon pan. Lightly tap the pan a few times on a table top to get rid of any trapped air bubbles in the batter. 8) Bake in a preheated 170ºC for 10 mins. Reduce to 160ºC and continue baking for 25 mins or until the cake surface turns golden brown, and a skewer inserted into the centre comes out clean. 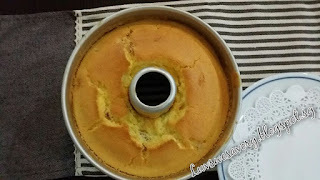 Cover with a piece of loose foil over the pan if top of the cake is browning too quickly. 9) When the pan was removed from the oven, I used the suggested technique to drop the pan at a height of 20~30cm onto a table top. 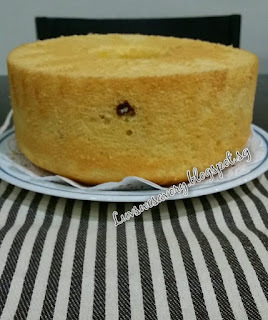 This action helps to keep the springy texture of the cake when it is left to cool. 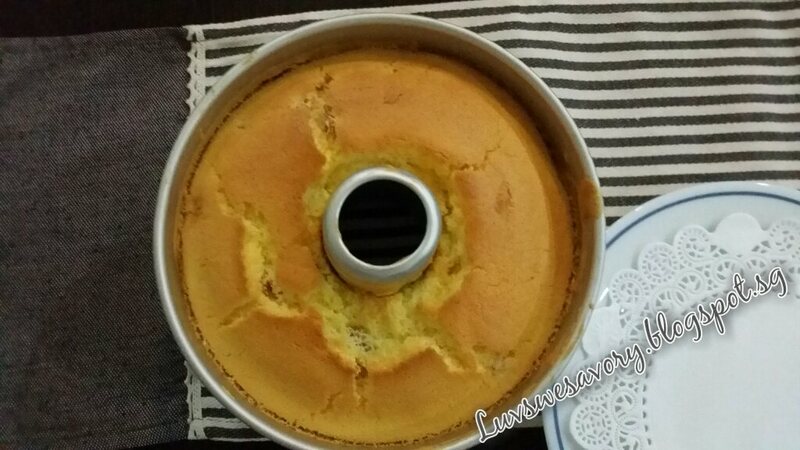 10) Immediately invert the pan to cool before unmoulding the cake from pan. a) Run a thin-bladed knife or palette knife around the edge of the pan and the funnel. Release the cake and run the knife along the base of the pan to remove the cake. b) By hand, gently pull cake from the sides of the tube pan. Turn the cake pan over and press down on the bottom firmly to dislodge. Gently pull the cake from the base around the edge and around the whole cake. Continue to lift up the cake and moving inwards until you reach the tube. Yeah !!! 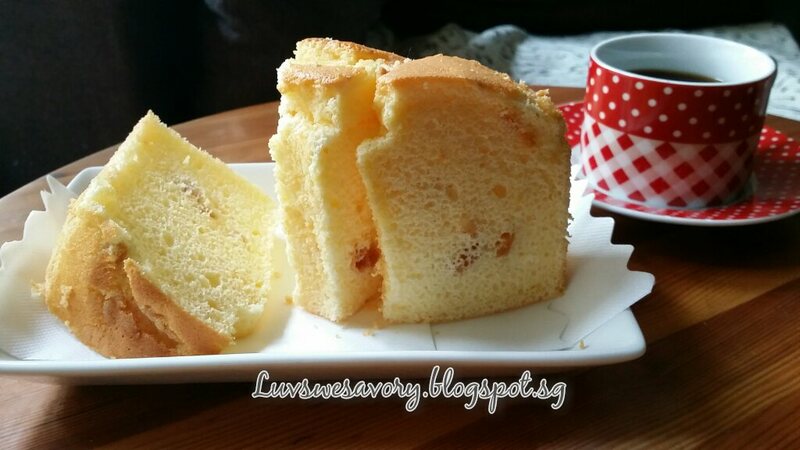 first time I unmould a chiffon cake with bare hands ! Thanks to Susanne of Loving Creations for You for the video tutorial on how-to unmould chiffon cake by hands. Yeah ! I could unmould the cake with bare hands! 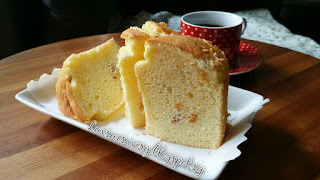 the texture is so light and spongy ... so, are you convinced? Go bake this spongy cheesecake-like yogurt chiffon cake if you have not baked one before ! Enjoy & Happy baking ! That looks feather light and airy! A perfect chiffon, Karen. Thanks for the compliment, Angie. Thanks for dropping by Baili. Sounds good and scrumptious, wish I can have a slice of it. I can see that it is very light and fluffy. 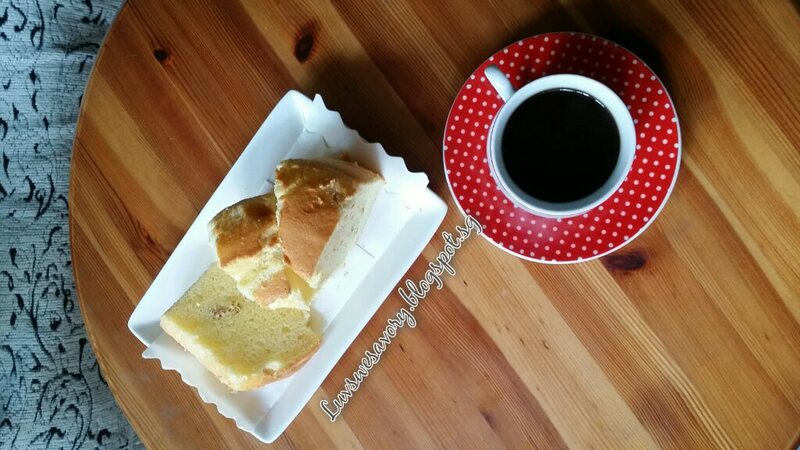 I remembered I tried once baking a chiffon cake. It failed miserably and I never tried again. Lol! Lovely cake! Two slices for my tea-time please!